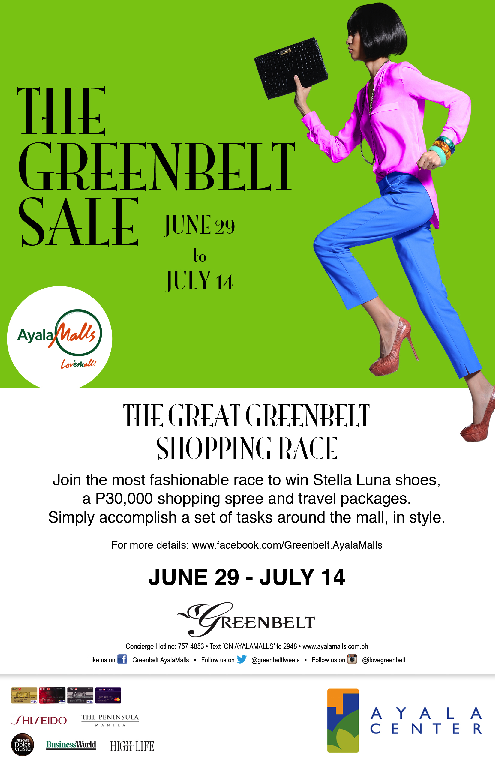 Kikay Corner > shopping > Are You Ready for the Great Greenbelt Shopping Race? Are You Ready for the Great Greenbelt Shopping Race? 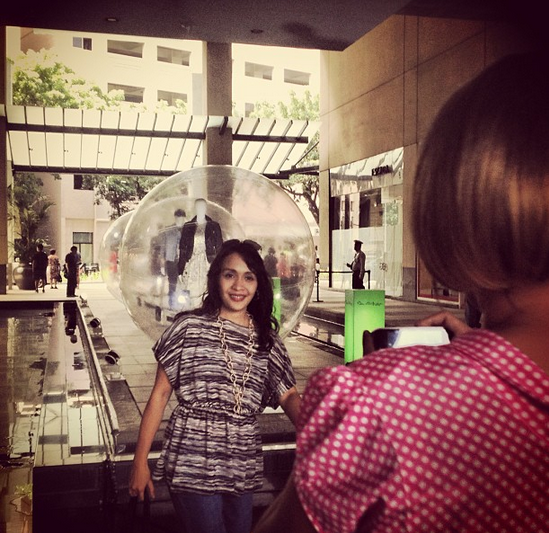 Together with a few lovely bloggers, I spent a very challenging and fun day today as we did the bloggers edition of The Great Greenbelt Shopping Race, which is officially happening from June 29 to July 14, 2013. Congrats to Cheyser and Kaye! I kind of already knew that Cheyser was going to be one of the winners. She was seated beside me during our Mr. Jones lunch and with her nitty gritty of plotting out each task, carefully checking out each task and probably googling (I didn’t peek) on her iPhone the exact location for each merchant. When I saw her scribbled “dulo” on the “Escario studio” task, it was a giveaway for me that she’s going to bag it! I just knew I had the makings of a CSI agent with my very active radar. Not to mention, my gift of prophecy. 🙂 So happy these lovely ladies won! There will be five (5) weekly winners of the Greenbelt Shopping Race and each will take home two (2) pairs of Stella Luna shoes, no less! There will be 5 Grand Draw Winners of even more fab prizes! Two (2) winners will receive ten (10) pairs of Stella Luna shoes each. One (1) winner will receive a P30,000 shopping spree and there will be two (2) winners will each receive a travel package to Bellevue Resort Bohol. What’s really nice is that Greenbelt Ayala Malls made joining The Great Greenbelt Race so easy. 2. 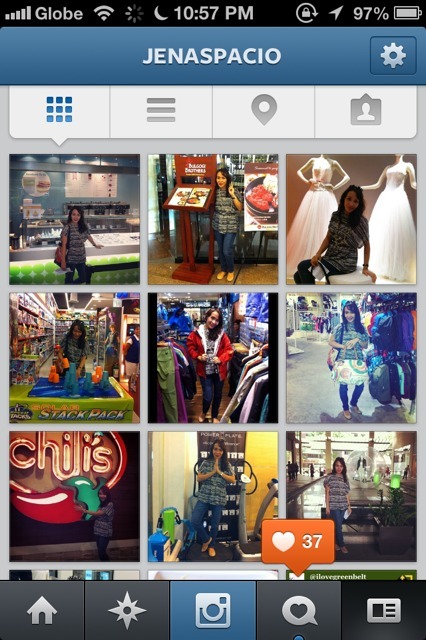 Follow @ilovegreenbelt on Instagram. 3. 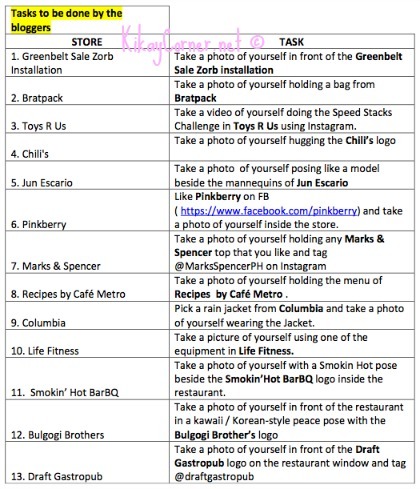 Designated tasks of each of the participating Greenbelt Ayala Mall merchants are given out for each week and will be announced on Facebook. -→ Do the task, post the photo on Instagram, tag @ilovegreenbelt and use the hashtag #GreenbeltShoppingRace for your entries to count! It’s great that there are always blogging events dyan satin. Seems a fun and exciting event to join. The experience comes first and the prize if ever, bonus na lang. Ma-share nga kay misis.